Plays important functions in early cell signaling. Binds the cAMP response element (CRE) (consensus: 5'-GTGACGT[AG][AG]-3'), a sequence present in many viral and cellular promoters. 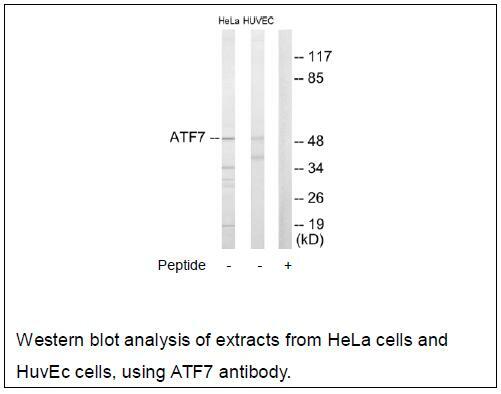 Activator of the NF-ELAM1/delta-A site of the E-selectin promoter. Has no intrinsic transcriptional activity, but activates transcription on formation of JUN or FOS heterodimers. Also can bind TRE promoter sequences when heterodimerized with members of the JUN family. 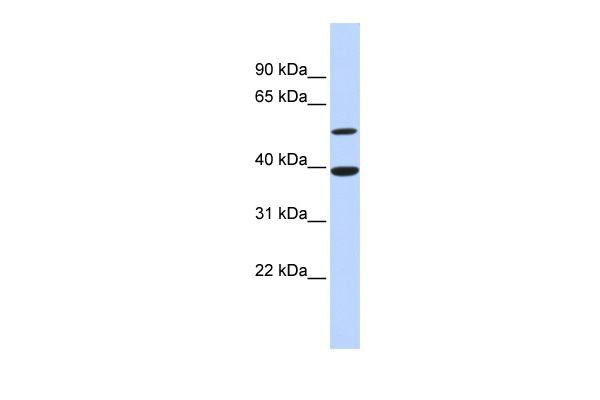 Isoform 4/ATF-A0 acts as a dominant repressor of the E-selectin/NF-ELAM1/delta-A promoter. 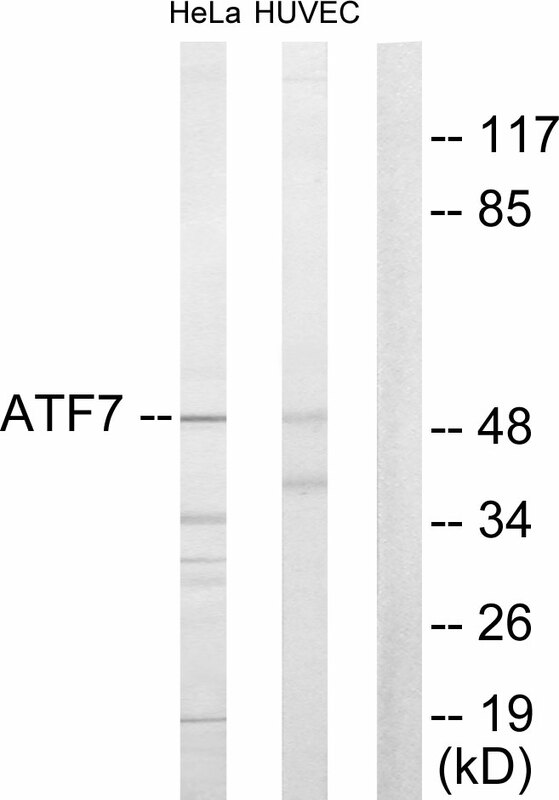 Isoform 5/ATF-4 acts as a negative regulator, inhibiting both ATF2 and ATF7 transcriptional activities. 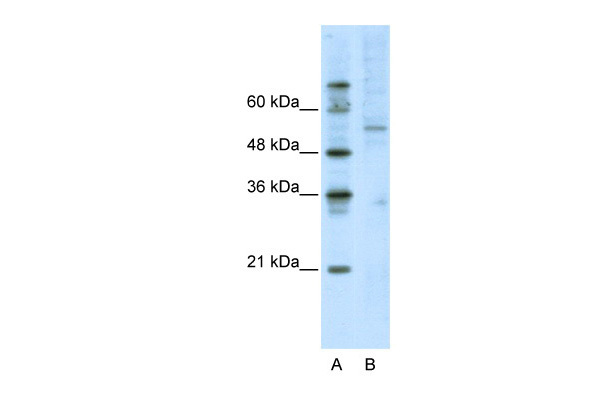 It may exert these effects by sequestrating in the cytoplasm the Thr-53 phosphorylating kinase, preventing activation. Nucleus. Nucleus › nucleoplasm. Note: Mainly nucleoplasmic. Restricted distribution to the perinuculear region. 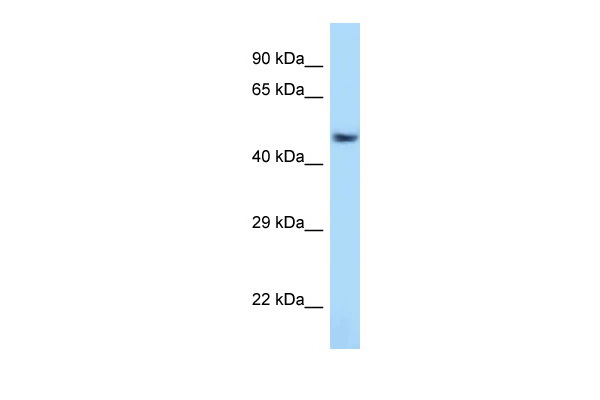 The sumoylated form locates to the nuclear periphery. Isoform 5: Cytoplasm .